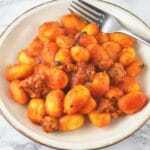 This Gnocchi with tomato and 'Nduja recipe is the perfect way to warm up on these chilly evenings. It's super simple and extra comforting! Take the sausage out of it's skin and brown in a large frying pan. Break up the sausage with the side of a wooden spoon as it's browning until it's in small pieces. Finely chop the garlic cloves and add to the pan with 1 tsp of olive oil. Fry for 30-40 seconds then add the passata. Add the N'duja, oregano, basil (roughly torand season with salt and pepper. Stir everything together and let it simmer until the gnocchi are ready. Add the gnocchi to the boiling water. Once the gnocchi reach the surface of the water, drain. Turn the sauce off the heat and add the gnocchi. Stir the gnocchi until it's evenly coated in sauce and serve.